In this video, you'll see how to make a Buttermilk Pie. This bright and tangy pie may be the best pie you've never even heard of. Chef John describes it as a cross between vanilla custard, lemon meringue, and a super-light cheesecake -- only it's better. This buttermilk pie is also easy to make and gorgeous to look at. If you like, top your pie slices with seasonal fruit. Watch the video, then get the recipe for Chef John's Buttermilk Pie. The classic Southern buttermilk custard pie with a sprinkling of nutmeg. 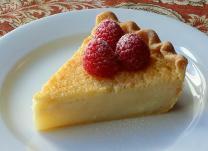 Sweet, rich and creamy, this is a custard pie that no one will guess is made with buttermilk! It 's wonderful as is, but downright sinful when adorned with a spoonful of molasses.